Courtesy of Charlotte Brynn, Vermont Open Water Swimming Hall of Fame, Vermont. Vermont Open Water Swimming Hall of Fame founding members Ned Denison and Philip White were inducted to the Vermont Open Water Swimming Hall of Fame on September 14th announced Charlotte Brynn, Chairperson of the Hall Of Fame. “Vermont is blessed with many wonderful waterways, including river fed lakes, such as Lake Champlain, and Lake Memphremagog, along with, glacial carved lakes, such as Lake Willoughby. Eligibility is open to residents of the State of Vermont or those with a substantial connection to Vermont at the time of their achievements. It is open to open water swimmers who use wetsuits or these with physical issues which necessitate the use of appropriate aids. In addition to achievements and contributions, the character of the individual or organization will be taken into account during selection for induction or to remain an Honoree. "Ned Denison is honored as a Marathon Open Water Swimmer, Contributor-Organizer, and Ice swimmer," explains Brynn. "The native of Vermont is currently Ireland’s most prolific marathon swimmer with 39 epic marathon swims: the Triple Crown of Open Water Swimming, an Ice Miler, former 1 km Ice Swimming age group record holder, 12 different Prison Island Swims and the the first person in history to swim around the Great Island and Valentia Island. 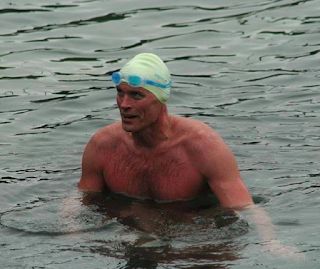 Ned is internationally recognized as an International Marathon Swimming Hall of Fame inductee and a member of its Executive Committee, and as a recipient of the International Swimming Hall of Fame's Irving Davids/Captain Roger W. Wheeler Memorial Award and the Poseidon Award as part of a Cork Global Open Water Swimming Organising Committee. In Ireland, he started and led the marathon craze in Cork now with 138 marathon swimmers. In addition to his early organizational involvement with the Lee Swim and Sandycove Island Challenge, Ned started the Cork Distance Week with 50+ attendees annually since 2009. He set the speed records for International Self-Transcendence Marathon-Schwimmen veterans 9 years and The Cold Half in Hong Kong 3 years ago. Denison, not only grew up in Vermont, he learned to swim in Vermont’s Lake Champlain during cold spring days in April. He competed as an age group swimmers for 12 years in Burlington, and also spent summers swimming open water in Maine. He completed a 1-mile crossing of Lake Champlain at age 12. In 2005, he became the first person with Vermont connections, to swim the English Channel. He returned to Vermont in 2006, to race across the 8-mile Lake Champlain, giving an inspirational talk to his fellow swimmers. When Phil White reached out to Denison as a source of information on marketing and organizing open water swims in the Northeast Kingdom, in 2009, Denison didn’t hesitate. He offered support, and was also the remote safety officer to approve the first few lots of swimmers." Brynn continues, "Denison has advised, inspired, and guided many in open water swimmers in Vermont, and those with connections to Vermont. His induction to the VTOWSHOF spans 3 categories, to cover his many talents, and abilities. According to Denison his strength lies in inspiration. We at the VTOWSHOF, know his reach goes much further." Denison and White join Charlotte Brynn, Gary Golden, Bettany Bosch, Don Houghton, Jr., Cynthia Needham, Bill Shipp, Chris Steele, Gail Steele, Sarah Thomas, and Paula Yankauskas in the Hall of Fame. For information on Philip White's induction, see here.